Have your kids ever struggled with getting to bed and staying in bed? I know if they have struggles, so have you! There’s nothing worse than not getting the sleep you need. My family was recently able to try out the Elo Pillow and it’s now a fun part of our bedtime routine. About: Elo is a mom-created, kid-loved, doctor-endorsed, bedtime system that promotes healthy sleep and a more enjoyable bedtime. I wanted to try something a bit different and fun for our youngest who likes to get up a million times before finally settling in for bed time. He is in the room with his brother so they like to watch t.v. and talk but most of all come ask mom and dad hundreds of questions or look for reasons to avoid bedtime. With school finally in session I knew I needed to do something to help him get a good night sleep before heading to school to be a Kindergartner all day. After receiving our new Elo My Storytime Pillow, Eli was really excited and was ready to go to bed right then just so he could listen to the bed time stories. Setting the Elo pillow up is really easy with simple directions. It requires a WiFi connection so that you can create a free account on Elo’s website to have access to all the storybooks, volume and battery level. You send your kids to bed with their Elo Pillow and they are encouraged to stay in bed. If they lift their head, then the story stops and the Elo Pillow will stop the story and tell them to lay back down and the story continues. It is recommended for ages 2-9. Our story list has Clifford the Small Red Puppy, Pirates love Parades, Chimpanzee Sleeping in my Bed, Deep Blue and Baby Horse Says Goodnight with a total run time of 31:35. The first night Eli went to bed, turned on his pillow and listened to all the stories. His brothers wanted to give Elo a try so they have been taking turns with story time. After story time the pillow automatically turns off or by pressing the button on the back you can turn off. I really like that it automatically turns off so that I wouldn’t accidentally wake the boys up by going back into the room and moving his pillow. This pillow has helped greatly with bed time and the kids stay in their beds. I’ve noticed that the Elo Pillow allows for kids to go to sleep peacefully and not stressed out. The books give them time to unwind and really feel at peace before they go to bed. Let’s face it, their days are filled with chaos and this gives them a time to really relax and unwind. I’m really wishing we would have invested in an EloPillow a long time ago because it really does work. If you’re interested in getting your own Elo for the little one or not so little one in your family, you can check out the Elo Pillow store right on their website. You can even buy various pillow cases to go with your Elo. What’s really cool is the books Elo has to choose from last quite a long time! Some up to 35 minutes and beyond. Your child will have plenty of time to fall asleep without the story abruptly ending. I have found the Elo gives my children a sense of security. They love it and I’m happy the love it so much! Happy kids, happy mom! Brilliant idea and a wonderful way to help kids learn to sleep and hear a great story! I know that many of my readers here would be excited to win this wonderful giveaway! 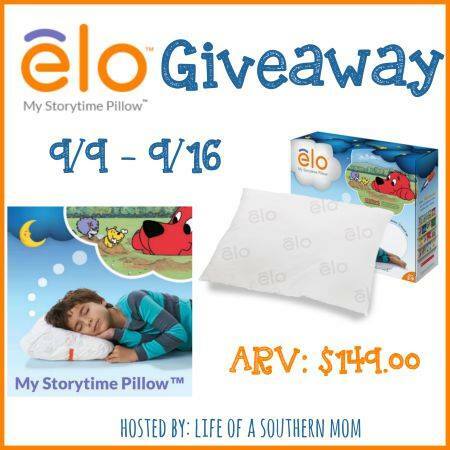 Life of a Southern Mom is teaming up with Elo to give one lucky reader a chance to win their very own Elo My Storytime Pillow for their little one. Disclosure: By entering you agree to abide by the Terms and Conditions listed below and on the Entry Form. All winning entries will be verified. The winner drawn randomly using Random.org, will receive an email from Jennifer at lifeofasouthernmom@gmail.com and will have 24 hours to claim prize or a new winner will be chosen. The Sponsor is responsible for prize fulfillment. Void where prohibited by law. Limit one entry per household. The odds of winning are based on the amount of entries received and completed correctly. This giveaway is open to US residents who are 18 years of age or older only. Good Luck! I have trouble getting him to sleep in his own bed. He’s been sleeping with me every night and every nap since he was a month old. I really need some sleep. I struggle with getting my child to the bedroom, without a fit! Luckily I never had a problem with getting my children to sleep but my granddaughter wants to stay up all night and she will sneak to read and play. The biggest struggle for us is getting my youngest to stay in his own bed! Knock on wood… our biggest struggle is getting to him settle down. He always has an excuse… he needs to go potty (again), he needs a drink, a hug, a kiss, covered up, the lamp on, the lamp off,……. Getting him set up in bed in the hardest struggle. She never wants story time and reading to be over! I actually would like to win this for my blind mother. I don’t have small children. I struggle with them with going to bed at a reasonable hour. I struggle with my kids staying in their beds. I’ve never seen this product before but it looks interesting.